On July 21, Snooty—formally known as "Baby Snoots"—will turn 67. That's a perfectly fine age for a person, but for a manatee like Snooty, it's record-setting: So in addition to a birthday bash the weekend before Snooty hits the big 6-7, the manatee will be inducted into the Guinness World Records. Wild manatees typically live into their 50s, but boats and environmental hazards often cut their lives even shorter. Snooty, however, was born in captivity on July 21, 1948, after his pregnant mother was captured and brought to the Miami Aquarium and Tackle Company. Mother and son were separated because the owners' permit only allowed them to retain one manatee, so Snooty bounced around before settling in at the South Florida Museum in Bradenton, Fla. the following year, where he has lived ever since. 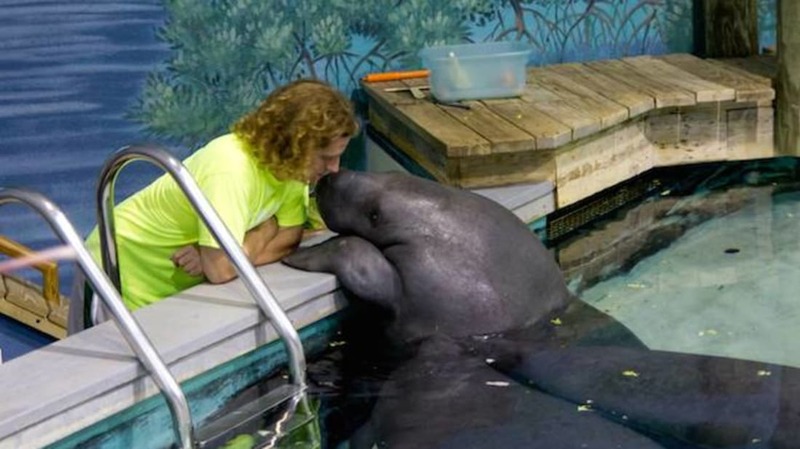 For the most part, Snooty has lived a solitary life in Florida. In 1973, the passing of the Endangered Species Act required that manatees only be kept in captivity "for rehabilitation or because they have permanent injuries that would preclude their survival in the wild," according to Katie Tripp, director of science and conservation for Save the Manatee Club. "Manatees aren't kept for just display or bred for display in the U.S."
But according to the aquarium staff, "he's definitely more interested in people than other manatees. He doesn't really seem to form bonds with other manatees, but doesn't seem to mind them. He really likes people," South Florida Museum spokeswoman Jessica Schubick told Huffington Post. What's Snooty's secret to longevity? Twice-yearly comprehensive veterinary checkups and a strict diet: 70 pounds of romaine lettuce, plus another 10 pounds of kale, broccoli, carrots, and other vegetables—with the occasional piece of fruit thrown in—every single day.